I found a tello in stock at my local Walmart. Purchased with the app, picked up in store and received a $5 discount, $94.00. So I pre-ordered a Tello from B&H a while back, and then saw people saying they were in-stock now at Walmart. I thought hey, I"ll pick one up now and give the B&H Tello to my buddy's daughter who likes flying my drones. I put a couple of orders in at the Walmarts near me - they all got cancelled as out of stock, but one I went to pick up this afternoon. Turns out they had picked a Yuneec Breeze 4k w/Bluetooth controller. I tried unsuccessfully explaining that it was not the same drone, but the person kept insisting the Breeze was a Tello. The Breeze was more expensive, so I thought what the heck. Now I can compare when I get the Tello from B&H, ha!. Maybe with a little luck the Yuneec controller will work with the Tello, too . 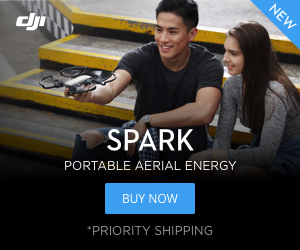 . .
Walmart sold you a $200 drone for $99. What a deal. I'd like hear a comparison post when you get a chance. Walmart has the Breeze for 150 on line and I was thinking of picking one up as a gift. If they sold me one for 99.00, I'd jump on it. Had no plans to buy one since I am still learning my Spark, but I just happened to check Walmart and found they had one in stock so I just have to pick up my order. Same, had to cancel my B&H order as well. Not so impressed with B&H not even yet shipping and I hear the drone is in local Wal-Marts. I'd like hear a comparison post when you get a chance. Will do. been busy with work lately and haven't had a chance to try it out, hopefully this weekend. Not so impressed with B&H not even yet shipping and I hear the drone is in local Wal-Marts. B&H's shipment must be on the slow, slow boat. The Walmart website listed several stores in stock near me, but all my orders got cancelled as out of stock after being placed. Finally found a Walmart with one in stock! Picked mine up today and flew out the kitchen window down to the shed trying to see if the rabid raccoon was still there. Too dark! Also tried it with a little wind but it still performed well. Got mine at Walmart Danbury, CT. They had one left hanging on the display for anyone looking for one in that area.